By default Connectify Hotspot dynamically selects an IP range for your hotspot, and uses DHCP to give out automatically chosen IP addresses to all of your clients. However, for more advanced users, you can manage them yourself by either specifying a range of IP addresses or statically configuring them. 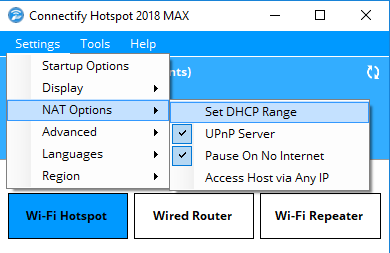 Custom DHCP Controls is a feature available only to Connectify Hotspot MAX users. If you don't actually need clients with static IP addresses, we suggest that you leave all of these settings in "Dynamically Managed". This allows Connectify Hotspot to intelligently pick ranges and addresses that will never conflict with any other connected network. You can specify a DHCP range in Hotspot via the 'Settings' menu under 'NAT Options'. 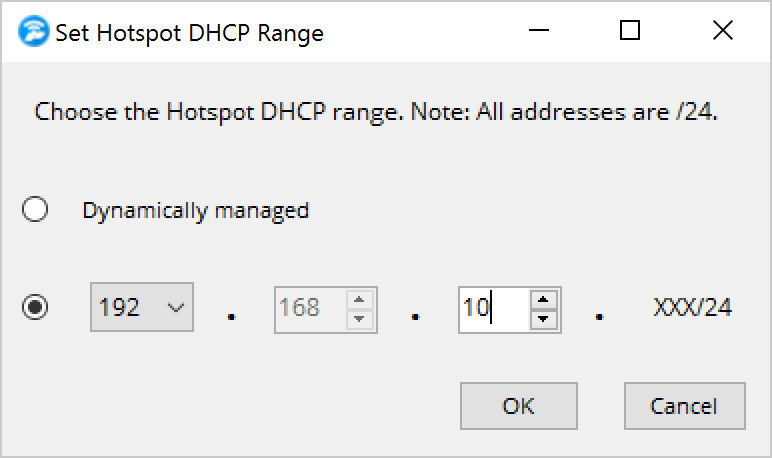 Setting a DHCP range will tell Hotspot to only assign an address within the configured IP range. You can choose to have an IP range of '192.168.x.x' or '10.x.x.x'. Once you've set a DHCP range for your hotspot, you can set Static IP addresses for any of your clients that require them. 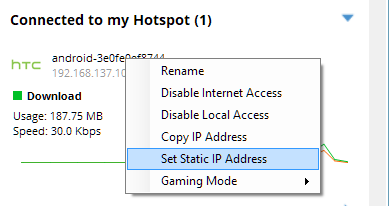 Once a device has connected to the Hotspot you can choose to set a Static IP address via the Clients Tab by right-clicking on the device and selecting 'Set Static IP Address' from the menu. Your Client's IP address must always be inside (i.e. start with) the DHCP range that you selected. 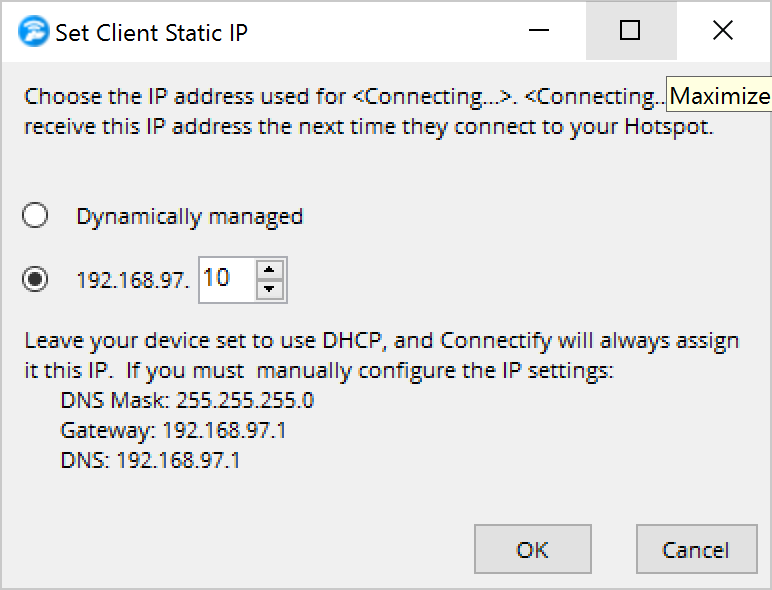 By configuring a Static IP address you are telling Connectify Hotspot to always assign your device that IP address. If you want to have access to custom DHCP controls for your Hotspot you can purchase a MAX license from our online store at https://www.connectify.me/wp-aux/store.php. How do I fix Duplicate IP Range?